I have previously paid little heed to the Molle typewriter. Perhaps, instinctively, I sensed there was something deceptive about it, something of which I should be wary. 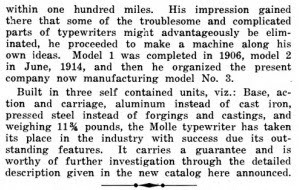 Now that I have devoted many hours today to researching the man and his machine, I have come to fully appreciate why John Edward Molle was one of the great mystery men of typewriter history. 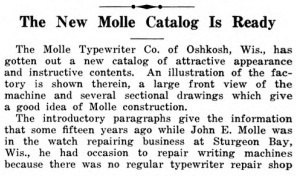 But Molle's true story, until now buried for more than 94 years, can finally emerge. 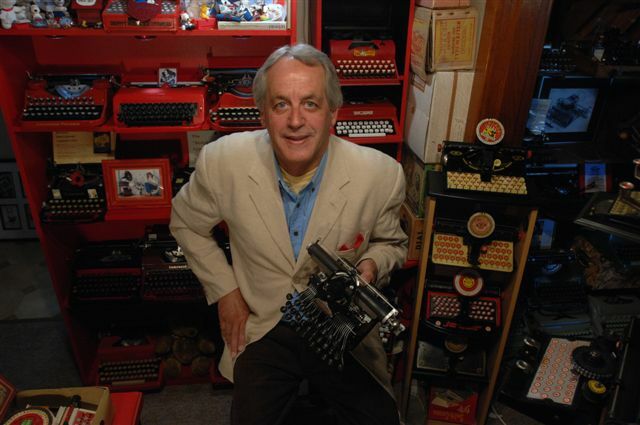 In my quest, I soon became aware that other typewriter historians had hunted in vain, over the very same territory, before me. Ancestry.com and FamilySearch had been peppered with enquiries, but to no apparent avail. As in so many such cases, an incorrect date can throw the most dedicated searcher off the trail. 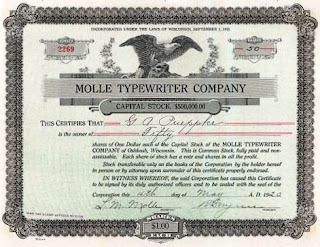 For example, in an article by Ed Neuert in the March 2007 edition of ETCetera (No 77), Ed writes, "Interestingly, John Molle is not mentioned in any of these Molle company documents of 1919 to 1922. It is known that he died in April 1921, but his final illness clearly had removed him from a role in the company long before that." What had removed Molle was the finality of death, not mere illness. He wasn't able to report to his stockholders, or anyone else for that matter, on September 15, 1919 - he had been dead and buried almost 17 months by that date. So let's start with the end. John E.Molle died in Oshkosh, Wisconsin, on April 27, 1918, not on June 9, 1920, nor on April 27, 1921, as other sites and histories have it. He was 46 when he died. 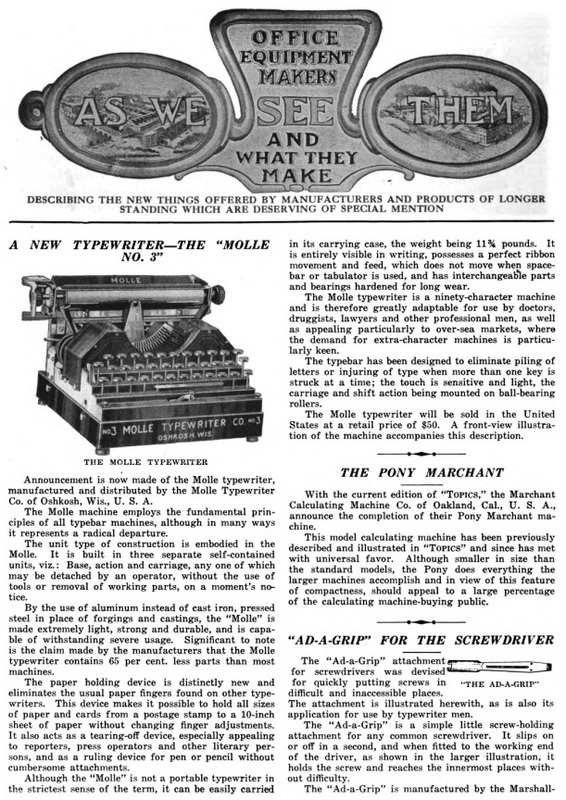 The final version of his typewriter, the Molle No 3, had not yet been launched when he died - it would be first described in the June 1918 edition of Typewriter Topics. 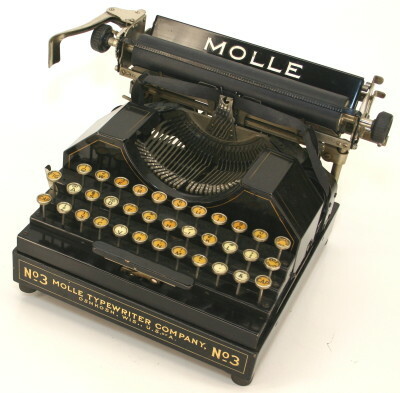 It's possible Molle died before he saw any of his typewriters go into production. But Molle did have a factory, at 53 Ceape Avenue, Oshkosh, a three-story brick and stone structure between State and Court streets, built in 1915. 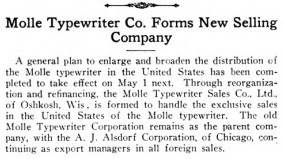 After Molle's death, the Molle Typewriter Company, incorporated in December 1911, was completely restructured. 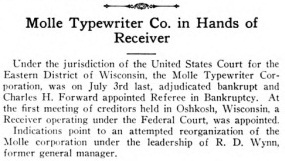 First Molle's widow, long-serving company secretary Lillian Mae Hogan "Lottie" Molle, and his brother, Wilhelm Franz Molle (1878-1971) took control, and appointed Robert D.Wynn to run the company. 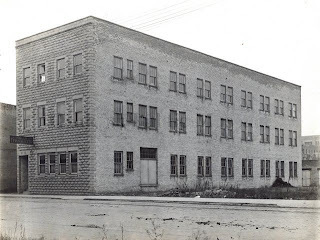 Wynn moved in with Mrs Molle as a lodger at 141 Cottes Street, Oshkosh. She was 37, he was 54. The company went public in 1920 and sold common stocks. See Lillian Molle's and Robert Wynn's signatures below. John E.Molle was born on March 17, 1872, in West Kewaunee, Wisconsin. He was NOT born on April 27, 1876, nor in Rapids on July 11, 1866. His father was Charles Molle (1838-1912) and his mother Johanna Luise Schultz Molle (1845-1927). Both parents were born in Pommern, Cochem-Zell, Rheinland-Pfalz, Germany. 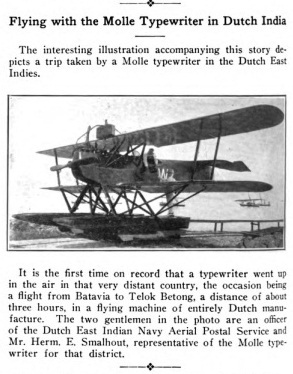 John E.Molle was indeed a watchmaker before he started dabbling in typewriters. 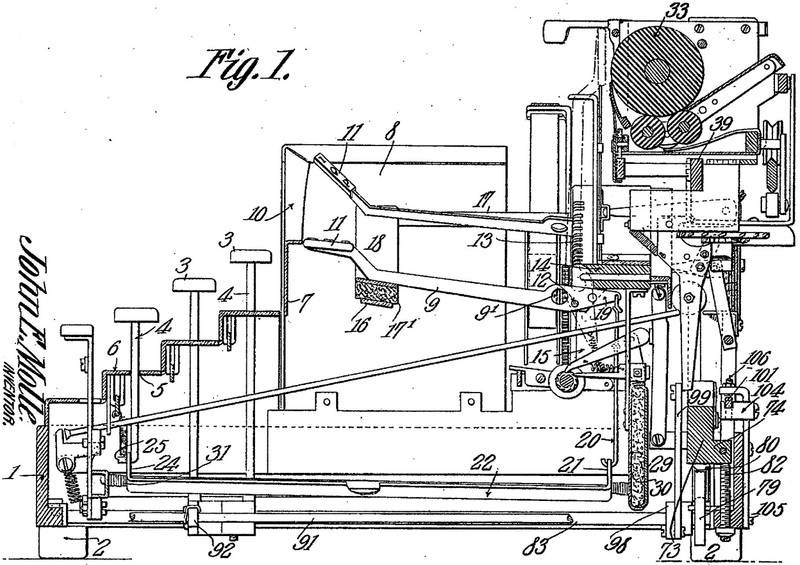 He was granted his first typewriter patent in 1906, while living in Sturgeon Bay, Wisconsin. 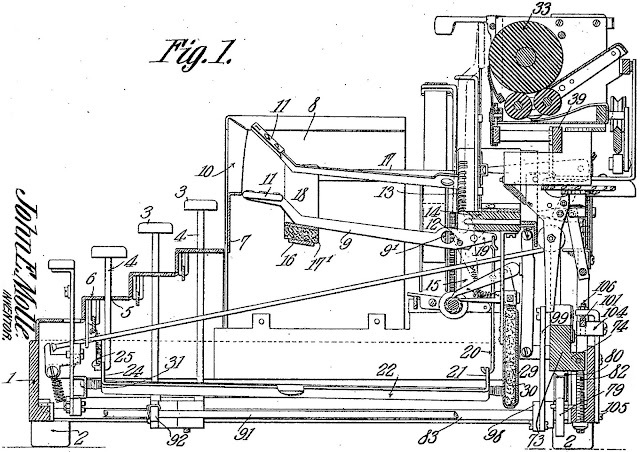 His second design was patented on this day (December 23) in 1913, and is for what became the Molle No 3. But is it 3 for three-bank, or for his third attempt? 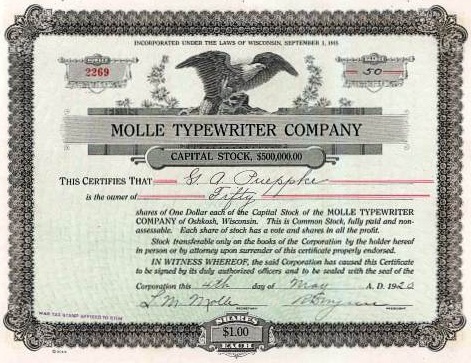 Before the Molle company went bankrupt in July 1922, as few as 6126 typewriters had been produced. See Richard Polt's webpage on the Molle here. Just came across your blog. Lillian Hogan Molle was a first cousin of mine. 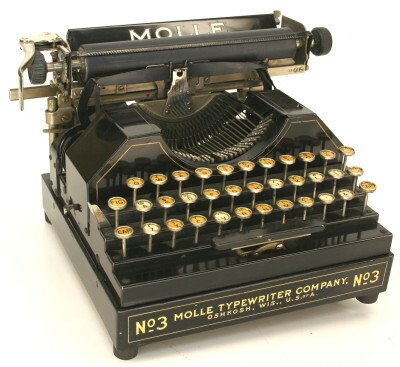 I am researching her on ancestry.com, and discovered her first husband invented the Molle Typewriter. Did not know this before. I would love to find one to see.